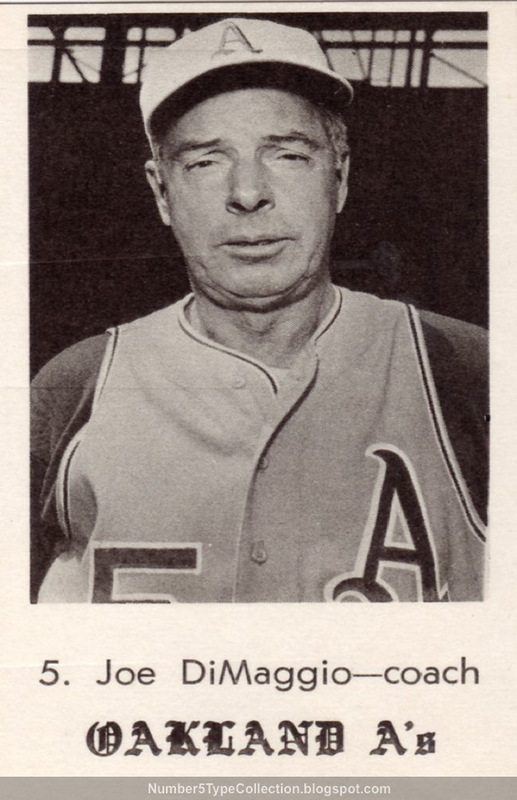 Best known for enduring achievements like a 56-game hitting streak and 9 championships in only 13 seasons as a Yankee, Joe DiMaggio later spent 2 years as a VP and coach for the relocated Athletics. Tired facial expression aside, seeing the Clipper in green-and-gold (okay, B&W) just looks...wrong. DiMaggio spent 3 bittersweet years in the US Army during WWII, achieving a rank of staff sergeant but never coming close to actual combat. I can't say enough good things about Gary Bedingfield's site Baseball in Wartime and his profile of Joe includes a ton of great photos and info. Nice card. He does look a bit tired, though. I wasn't aware of that set at all. Thanks for sharing. Just another reason I keep returning. I have never seen DiMaggio in anything other than a Yankee uniform or a suit. It's an answer to the previous year's musical question: "Where have you gone, Joe DiMaggio?" Thanks. The SCD big book says a little more about the set. Boston photographer Mike Anderson printed this set and he did a follow-up in 1970, but DiMaggio left the team after 1969, so no more shots of the Oakland Clipper. Contest winnings from Rain of Error! Type Site: Oh My O-Pee-Chee! Poll wrap-up: Return a counterfeit card? Would you keep a counterfeit card?